LOS ANGELES (AP) Stephen Curry was having an off night. By the time the fourth quarter ended, he had hit only six of 17 shots – and three of those misses were air balls. But when the game went into overtime, the two-time MVP showed again what makes him the NBA’s best shooter. 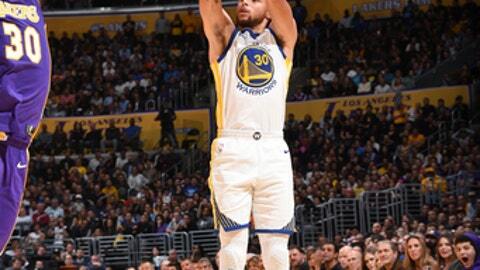 Curry hit two 3-pointers to open the extra period and the Warriors outlasted the pesky Los Angeles Lakers 127-123 on Wednesday. ”Obviously, he had a horrible start to the game, but what makes Steph, Steph, is on a night like tonight he can still make huge plays,” Warriors coach Steve Kerr said. Curry scored 28 points, 13 in overtime. Kevin Durant led the Warriors with 29 points and Klay Thompson added 20 as Golden State avoided losing consecutive games for the first time this season. The Lakers got a career-high 32 points from Brandon Ingram to push the defending champs into overtime. He and Durant dueled back-and-forth all night. It was the first meeting of the season between the division foes, also making it the first matchup between Curry and Lakers rookie point guard Lonzo Ball. Ball finished with 15 points and a game-high 10 assists. Kentavious Caldwell-Pope and Jordan Clarkson added 21 points each for the Lakers, with Julius Randle scoring 20. It helps when you have Curry, who despite struggling almost all night, can quickly step up when needed. After scoring five consecutive points in the third quarter, Ball was in a scrape on the floor for a loose ball when his head slammed against the court. It opened up a small cut above his left eye. The Lakers closed it with a Steri-Strip and Ball returned to the game. Los Angeles had a chance to win at the end of regulation when Randle rebounded Durant’s miss with 5.3 seconds to play. The Lakers set up a play for Ingram, but he missed a driving 8-footer. Despite the Lakers’ 8-13 record, Kerr sees positives in their rebuilding effort. Warriors: Play the second of six consecutive road games Friday in Orlando. Golden State has won its last nine against the Magic. Lakers: Travel to Denver to face the Nuggets on Saturday. Los Angeles beat the Nuggets 127-109 at home on Nov. 19, its second-largest margin of victory this season.